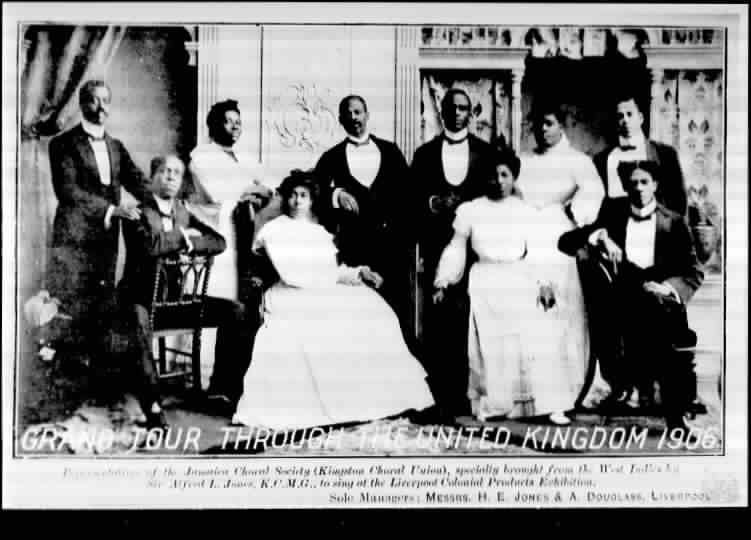 For a generation, from 1882 to 1914, the best-known and most popular choral group in Jamaica was the Kingston Choral Union; after its remarkable tours of the United Kingdom in 1906-8 it became known as the Jamaica Choir or, more triumphantly, "The Famous Jamaica Choir". Although the Choir itself seems to have faded away during the war years, references to it, and to individual members, continue to appear on into the 1920s and 1930s. Today, however, these pioneers of Black choral groups in Jamaica are neglected and forgotten. This website is one attempt to restore their memory in the island where they were once so well-known and honoured. About the same period Dr. J. Robert Love established two Black organisations, the Phillippo,Knibb and Burchell Memorial Fund Association, and the People's Convention; although both had some success, neither had the longevity of the K.C.U./Jamaica Choir. However, the earliest purely Black organisation I have so far seen reference to is the United Franchise Society in the 1830s, but I know nothing of it beyond the name. Almost all the text and pictures on this site come from sources which are in the public domain. My major sources have been the newspapers of the period, both in Jamaica and the U.K. The poor quality of many of the pictures is due to the fact that they are copies at three or four removes from the original. There are a very few references to the Jamaica Choir in other sources, such as books; this lack of references presumably explains why the Choir has been largely forgotten. Having been doing research for nearly 30 years in newspapers on microfilm, which is often the only option, I know from experience how tiring the work is. The only author that I have come across so far, who knows of the Jamaica Choir, is Jeffrey Green, a researcher in the U.K. He has a section on the Choir in his excellent and useful book, Black Edwardians: Black People in Britain 1901 - 1914 (published by Frank Cass); he has also written about the group in articles in academic journals. I am grateful to him for help he has given me.